In the night on Monday, Cyprus’s government agreed on a haircut of up to 40% on deposits exceeding €100,000 and bondholders, while protecting savings below the threshold of €100,000 (which are insured under the Deposit Protection Scheme, DPS) in order to restructure Cyprus’s ailing two big banks. Earlier plans which envisaged a haircut of at least 6.75% on all deposits were put aside, and rightly so. During the good times, that is prior to 2007/2008, Cyprus banks fell into a lending frenzy, expanding primarily to Greece, Cyprus’s most important trading partner which also shares its language and culture. Loans by Cypriot banks to Greece totalled 160% of Gross Domestic Product and the losses on these have been rising as a result of Greece’s economic slump. Exposure of Cyprus’s two largest banks is also revealing: According to the European Banking Authority’s stress test of 2011, Cyprus Popular Bank (Laiki), then called Marfin Popular Bank, had a total loan exposure to Greece of 44% (full report), while Bank of Cyprus’s loan book exposure totalled 30% (full report). After initially selling off some Greek sovereign debt, the two banks have continuously been increasing their exposure to Greek debt again in the midst of Greece’s economic trouble and hence higher yields. 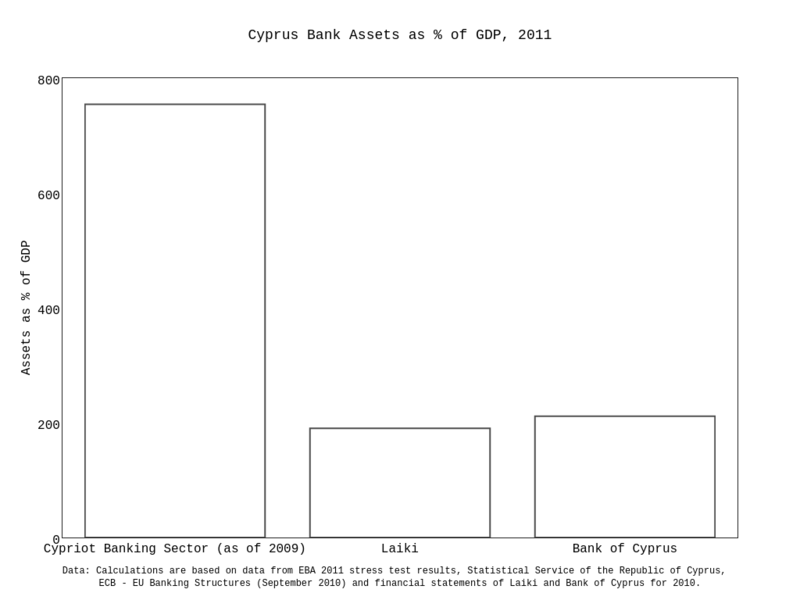 In total, the banking system of Cyprus held assets equivalent to 9 times GDP by 2010, compared to Eurozone’s 3.3 times in 2009 (Stephanou 2011). The bulging asset side of Cypriot banks was financed by deposits which Cyprus attracted by not taxing foreigners’ dividends and capital gains and paying high interest rates. Indeed, interest rates on deposits during the past five years in Cyprus were roughly double as high as those in Italy and Spain and four times higher than in Germany over the past five years. This makes Cypriot banks’ strategy of attracting funds seem a dangerous course that had to be financed with high risk. Cyprus therefore is a template for all those countries that sought to attract capital by lax banking regulation and coddling the banking sector in an attempt to establish themselves as an international financial centre. And a capital of capital Cyprus became. At least insofar as Cypriot banks succeeded in attracting capital, mostly from Russia and from dubious sources, as the Guardian puts it. The European Union’s reluctance to step in and foot the bill for Cypriot banks’ mismanagement over the past couple of years is in fact attributable to the fact that it is mostly Russian oligarchs their money would bail out. What Cyprus agreed upon is in fact what would also have happened in other countries if our system was still shaped by the most basic principles of capitalist systems. When a bank fails, given deposit insurance, bank creditors (depositors whose deposits exceed deposit insurance limit as well as bondholders) will take a hit as soon as equity capital is wiped out. Bondholders and large depositors are being compensated for the higher risk by higher interest rates. Logically, if someone receives a compensation for bearing risk, they must be subjected to the dangers that come along with the risk, namely failure. That’s the whole thing behind risk premia. Without deposit insurance, however, things would be different. All creditors, including all depositors, would take their pro rata share of the loss of any given failure. But that doesn’t justify levying a one-time tax as was being discussed in Cyprus a few days before. Since deposit insurance is in place in much of the world, it must be honoured. Without deposit insurance, depositors (those whose funds exceed the limit and those whose doesn’t) might have chosen a different investment that would have better suited their risk attitude. Furthermore, not honouring deposit insurance in times of crisis would mean picking the worst of two worlds: increasing risk-taking by banks through the provision of underpriced deposit insurance and risking bank runs which are becoming more likely due this risk subsidy. What we have seen since the Financial Crisis is that bondholders and other creditors of financial institutions collect risk premia but are shielded from the effects that justify the very same. Without the risk of failure, however, risk premia are just a rent that people can collect that successfully lobby governments and regulators into serving their very own special interests. Cyprus, under pressure from the troika (EU, ECB, IMF) agreed on a plan that is more than compatible with a capitalist system, in fact, it’s the only way that at least emulates capitalism. Apart from the fact that Cyprus has allowed two of its banks to become too big to fail and still depends on a sizable bailout from the EU and the IMF, Cyprus way is the way to go: subject creditors of failing firms (financial and non-financial) to losses. However, doing so shouldn’t be something controversial, it should not even be worth mentioning – and it definitely shouldn’t be called a unique case by central bankers.